The owner of the Noble Falls Tavern is Brian Wickens. Although he currently looks like a pirate with his full beard and twinkly eye, he is a very smart cookie indeed. It was Brian that took over The Laughin' Barrel in Upper Swan and transformed it into the chic, cheerful family eatery it now is. Obviously feeling idle, some little while ago he obtained The Noble Falls Tavern as well and is now running both. 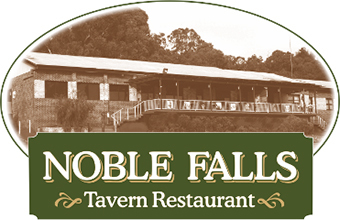 Noble Falls Tavern has had a chequered history over the last few years and a good deal of Brian's energy in the beginning was sorting stuff out and making good. New kitchenware, fridges, equipment and so on - all the expensive, invisible to the public stuff so vital to smooth running and good food service. The Tavern is the focal point of the local area, as every good pub should be. Angela and I called in on a Friday night to try the restaurant, The 2 Fat Chefs. So, one fat diner and his wife wandered into the bar to sample the wares on offer. The restaurant is accessible through the public bar, which that night was jumping, the drinkers were very well behaved, though. Excited, but good-natured talk spilled out and ebbed and flowed in cheerful chatter. One orders at the counter from the menu, but you don't pay there and then, you get a sort of credit card so that you can run a tab for the night. It's an excellent idea, so that if you see someone at the next table getting a particularly luscious dessert you can order it without breaking into the cash immediately. It's this kind of smart thinking that shows Brian's fine hand. The bar was being run, exceptionally ably, by Nicole, who wasn't juggling chain saws but I'm damn sure could if she wanted to. The menu is boldly, truthfully and proudly labelled 'Pub Grub', offering good hearty fare at very reasonable prices. It may not be a Yabbie fillet in Lime Sauce, but the 2 Fat Chef's Ultimate Steak Sandwich of Sirloin beef, crispy bacon, cheese, beetroot relish, tomato, lettuce, whole grain mustard, aioli and a side serve of chips ($19) looks much, much better to the average hungry diner. As well as the printed regular menu based on diner's requirements there is a chalkboard of specials, to keep the chefs interested. Dishes like Lemon Pepper Calamari, Pie of the Day, Reef and Beef, Sirloin Steak, Burgers and various kinds and so on - real, good food that people want to eat. After a certain amount of discussion we settled on our mains, ordered some cider and repaired to a table overlooking the verandah, the road and ultimately what would have been the Falls if it had been daytime. Skipping entree we went straight for the mains. As it turned out, this was a smart move as, honestly, I'm not at all sure that we could have managed both. Although I saw a serve of Garlic & Herb Bread going past and I think next time I'll make a special effort. 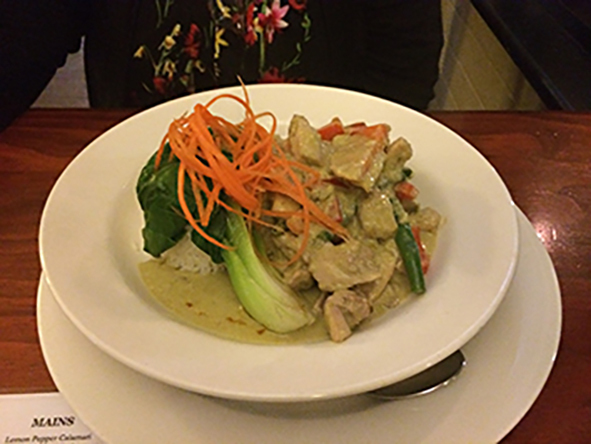 Angela likes curry in all its manifestations and so ordered one of the specials - a Thai Green Curry with Bok Choy and Jasmin rice. As with everything else, it was a generous portion. Very tasty, very flavourful but also very spicy hot. Some like it hot, including Angela, so, sweating slightly, she ate every scrap. 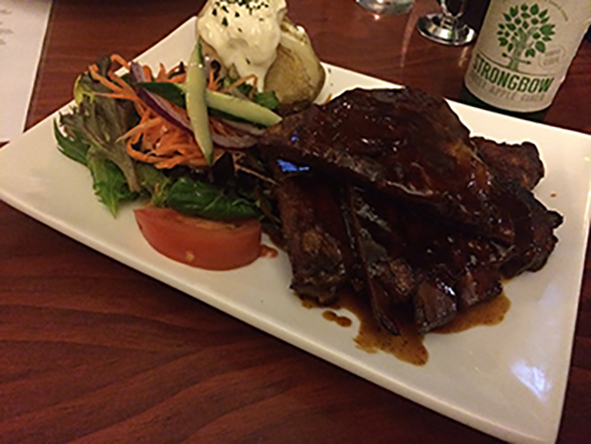 I had chosen one of my favourites, the Bourbon Pork Ribs with a baked potato, sour cream and a light salad ($26). Nicole mentioned when we ordered that the ribs were first cooked in Coke before slathered in the rich, delicious, marinade and cooked. The meat simply fell off the bone, tasty, tender and delicious. Absolutely superb. 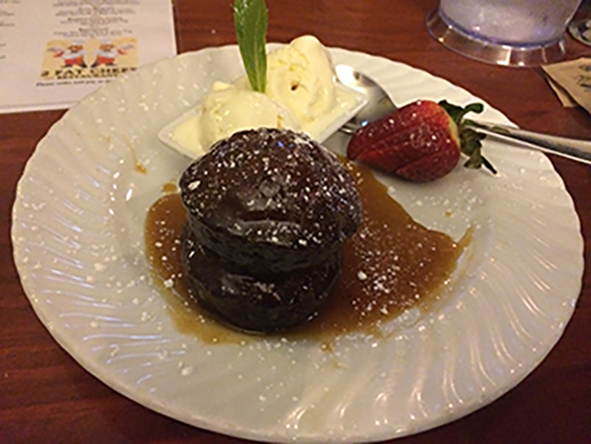 We shouldn't have had dessert, of course, but .... as Oscar Wilde said 'I can resist anything but temptation'. 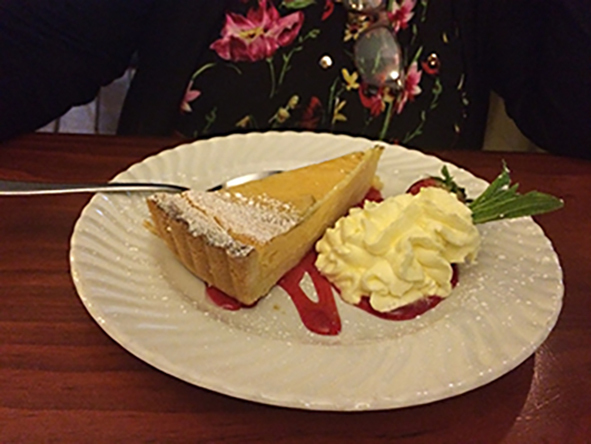 The desserts are always on the chalkboard at $8 - Berry Cheesecake, Pecan Pie, Pavlova in a berry coulis, a Muddy Mars (no, I don't know either) and a Lemon Lime Tart. Washed down with cider and a couple of coffees this was an excellent meal at reasonable cost. It's not fancy, but it's good. If you don't believe me, try it yourself, it's well worth the trip up to Gidgegannup. Why? Truly great pub grub.